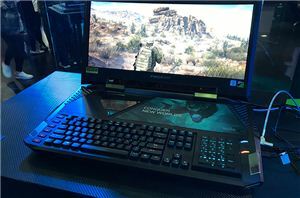 The Thunderbolt 3 technology has gained ground on the markets of premium as well as special-purpose hardware and is enjoying its dominance there. Yet when it comes to more or less mass-market products, it is only starting to take off. 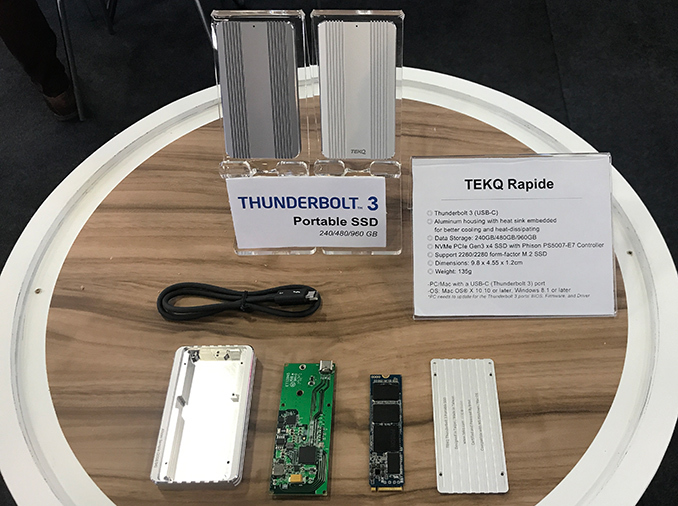 TEKQ, a company primarily known for USB flash drives and products like that, is demonstrating its Rapide TB3 SSD at Computex. Furthermore, the company is finalizing its next-generation TB3 storage device that will be able to offer higher capacities and performance. The TEKQ Rapide storage solution comes in a rather minimalistic brushed aluminum enclosure featuring space gray or silver finish to match popular Apple MacBook Pro colors. Meanwhile, when it comes to size, it is comparable to Apple's iPhone 5/5S/SE. The drive has a USB Type-C/Thunderbolt 3 header as well as a LED indicator. Architecturally, the Rapide is as simple as it is externally: it packs Intel’s DSL6340 (Alpine Ridge) TB3 controller and an M.2-2280/2260 SSD. We recently reviewed device as well. 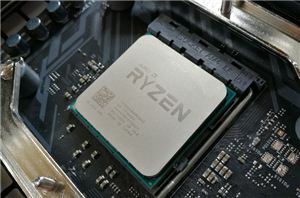 The drive that the Rapide uses is based on Phison’s PS5007-E11 controller and Toshiba’s MLC NAND memory made using the company’s planar 15 nm process technology. The performance provided by the Rapide is what you come to expect from a PS5007-E11-based drive: up to 2700 MB/s sequential read speed, up to 1500 MB/s sequential write speed, as well as to 300K/250K peak random read/write performance. Technically, the Rapide could use any SSD powered by any controller, but the problem is that Phison was the only company with a turn-key SSD solution that provided a firmware which ensured compatibility with Apple Mac computers over TB3, a crucial feature for many of TEKQ’s clients. TEKQ’s Rapide is available in 240, 480, and 960 GB configurations for $300, $389, and $800, respectively. Meanwhile, the company admits that as Toshiba is winding down production of 2D NAND in general, the 960 GB version is becoming a rare bird (grab it at Amazon if you need one while you still can). Therefore, the company is working on a new product that will replace the Rapide. This new product will address one major limitation that the Rapide has: a relatively low capacity. Professionals who work with video content need to store loads of data, so a 960 GB configuration is not enough for them. Meanwhile, even the highest-capacity consumer M.2 drives these days can only hold 2 TB of data, which is simply not enough for many people. 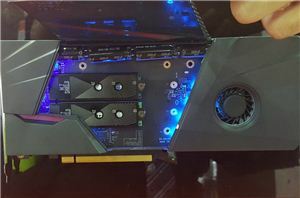 Therefore, to provide more flash to customers from the video industry, TEKQ’s next-gen TB3 SSD will feature two PCIe 3.0 x2 drives working in software RAID for performance and capacity. The drives, as one might expect, will be based on Phison’s PS5008-E8 controller with a PCIe 3.0 x2 interface as well as Toshiba’s BICS 3D NAND memory. 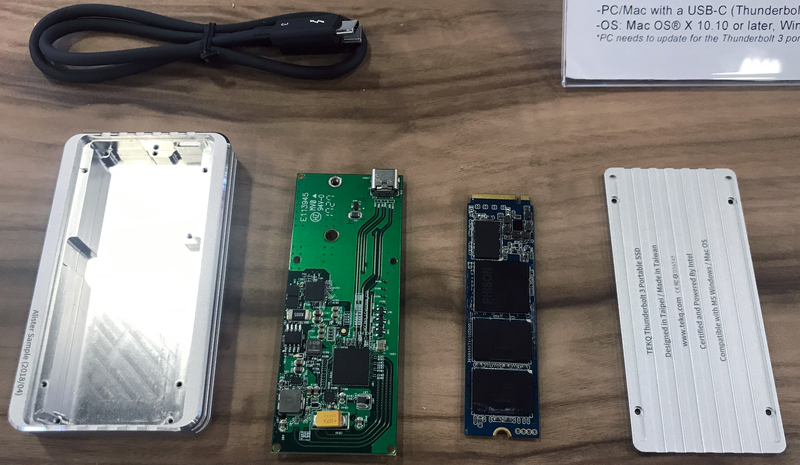 The decision to use two M.2 modules instead of one is a bit controversial because software RAID and an entry-level controller may not be something that professionals would be eager to use. 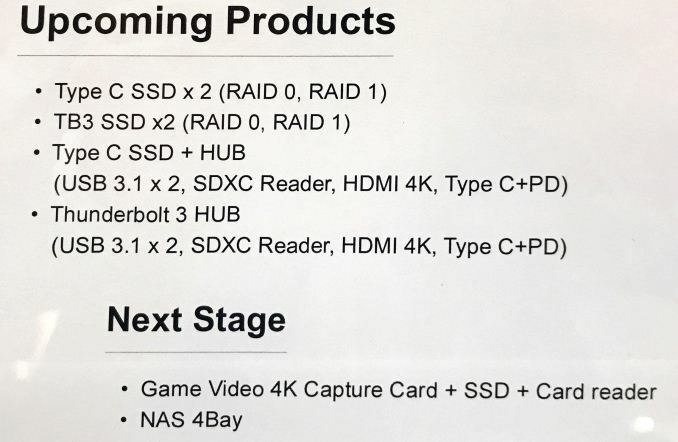 On the other hand, HP’s Z Turbo Drives also rely on software RAID (albeit they are based on Samsung’s SSDs) and it looks like there are not a lot of complaints because of the RAID implementation. 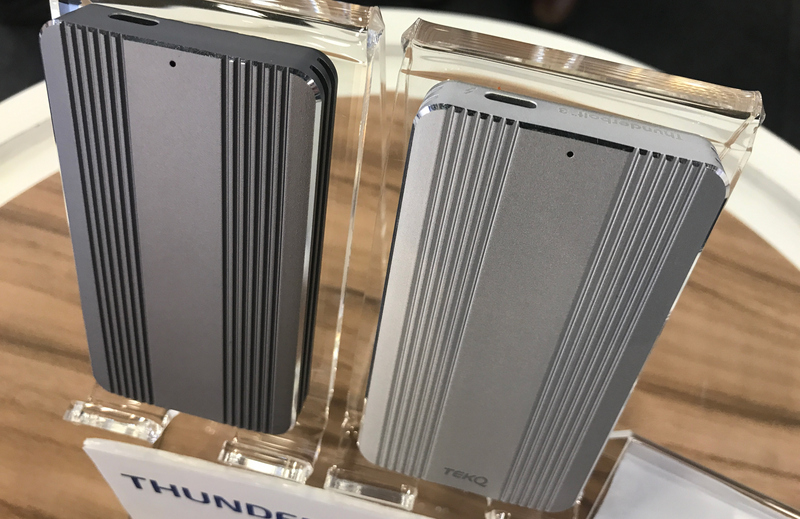 TEKQ says that the PCB for the next-gen Thunderbolt 3 storage device is ready (it does not disclose its branding or the TB3 controller it intends to use), so expect the company to produce appropriate drives for customers interested in capacity in the following months. Obviously, two SSDs will make the device a bit bigger, but it is not something that the target audience is primarily concerned about. 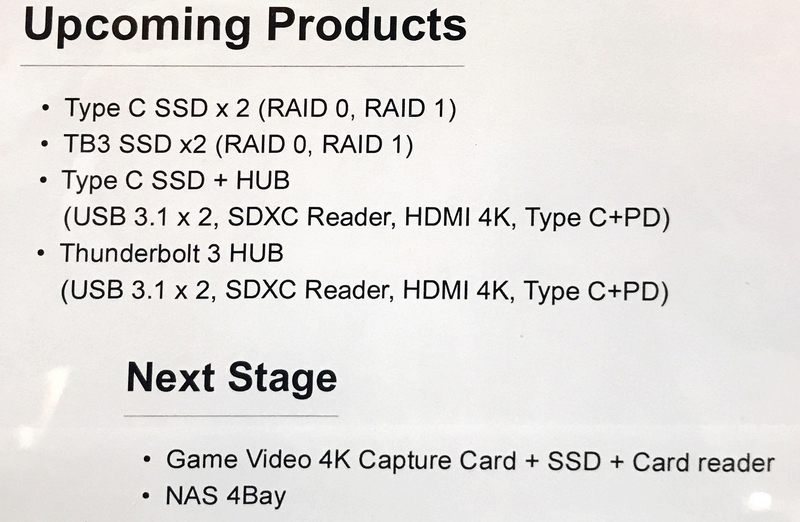 Meanwhile, nothing stops the company from using the Rapide chassis for SSDs based on the Phison PS5012-E12 controller and Toshiba’s BICS 3D memory (apart from the fact that such a drive would most likely destroy entry-level RAIDed SSDs).